These are new boards. At this time, I have 4 prototype boards for sale. These boards have been fully tested and work great. Very few changes are planned for production units. If you have questions or want to be added to a waiting list please contact me through Tindie or at info@adaptint.com . All information and code can be found on my website page www.adaptint.com/AdaptiveNewProductsPage.php . Orders placed on my website page for the DAAC-Hat will be directed to Tindie. Orders for new boards may take 3 weeks or more to process as raw boards and parts will have to be ordered and the boards assembled and tested. 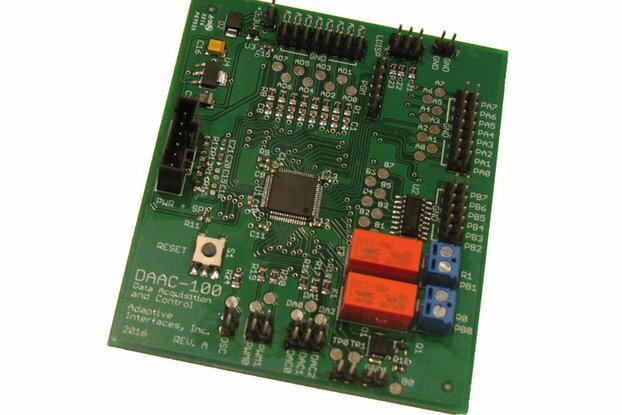 The DAAC-Hat is an Add-On board that provides 12-Bit analog measurement and control, plus a number of extra functions, to the Raspberry Pi 2 or 3. It attaches to the Raspberry Pi with a 40-Pin passthrough connector and requires no external power. Communication is over the SPI bus and, with the exception of SPI signals, all Raspberry Pi GPIO pins are still available and accessible. 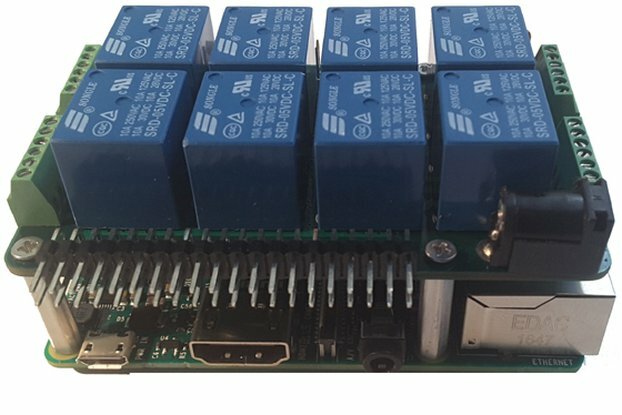 The DAAC-Hat can be operated right out of the box with a downloadable "Dashboard" Raspberry Pi GUI program or a multi-function command line program. A complete User Manual will soon be available as a PDF download. Until then, the DAAC-100 User Manual can be used as a reference. A list of command functions and command examples is also available. In January of 2016 I was visiting a friend who had just purchased a Raspberry Pi 2 computer. He thought very highly of the Raspberry Pi and I was impressed as well with all the features of this $35 computer. 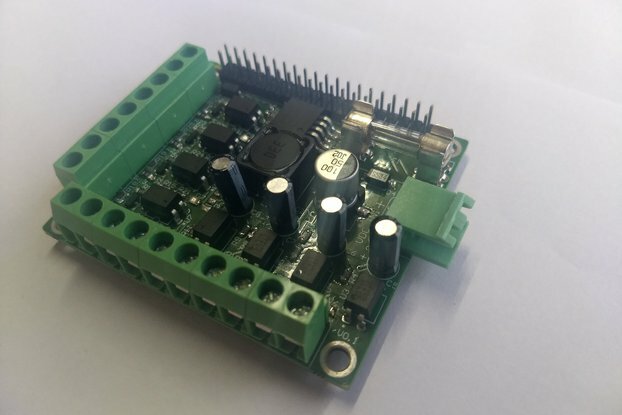 He said he wanted to use his RPi as a home controller, using it to measure temperatures and electricity use around the house and then using it to control his AC unit and electrical circuits. He then asked my thoughts on the Raspberry Pi. I started looking at the specs of the Raspberry Pi, especially the functions available on the 40-pin GPIO connector, and found that the RPi, by itself, had no analog inputs. While many smart sensors (ie. I2C) could connect to the RPi, there was no way to use basic, analog temperature, voltage and current sensors. Seeing many accessory boards that were available for the RPi, but none that offered high-resolution analog inputs and outputs, gave me the idea for the DAAC-Hat and DAAC-100. 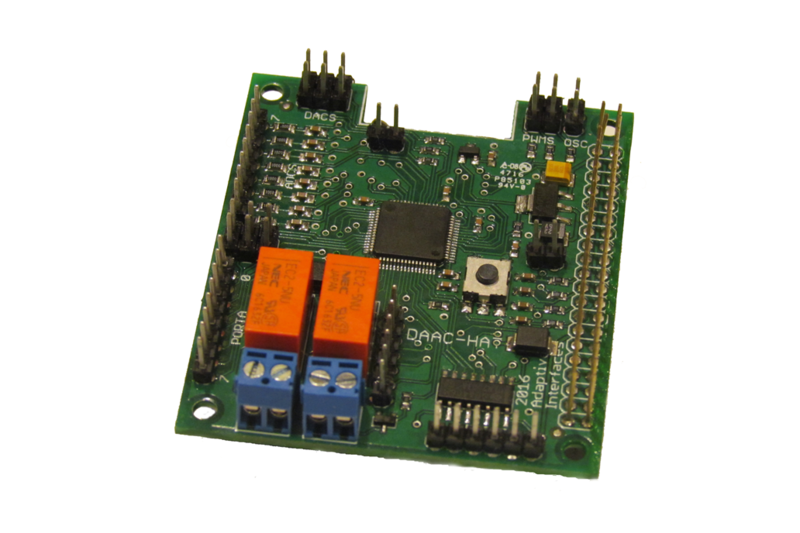 The DAAC-Hat is based on a 64-pin version of the STM32F334 Microcontroller/SOC. The STM32F334 is an ARM based controller with LOTS of peripherals. With the DAAC-Hat, I tried to make as many of these peripherals available to the user as possible, especially its 12-bit ADCs and DACs, PWM outputs and high resolution timer (used for a clock/frequency source with 1 Hz resolution at lower frequencies). Of course, a cool project board is of little use if you have to write tons of code before using it. I have written C based programs for the Raspberry Pi, all available for free download, that allow you to use the DAAC-Hat as soon as it is connected. Along with RPi executables and their source code, a complete Users Manual, that describes the SPI communication scheme of the board, is available as a PDF download. Feel free to use the source code as basis for writing your own custom programs for the DAAC=Hat and DAAC-100. Soon, I'll be creating projects for the DAAC-Hat and DAAC-100 and writing more custom code myself, all of which will be published on-line and available for download. Please note that the DAAC100_Dashboard and DAAC_Command programs work with both the DAAC-100 and the DAAC-Hat boards. Rates for shipment outside the United States will have to be calculated.